The latest video from the folks at Giant System features Netherfriends. 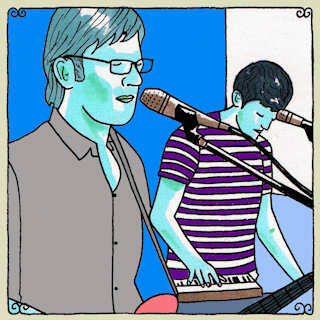 California Wives' Daytrotter session went live today and it includes great versions of three of the five songs from their EP Affair which was released back in September. California Wives play at Lincoln Hall tomorrow, Jan. 12th, as part of Tomorrow Never Knows 2011. Roommate is partnering with one of Chicago's newer labels Antephonic (the sister-label to Contraphonic, Inc) to release the band's third album Guilty Rainbows. The album is set to be released on March 22nd, but early report say that this is the band's most complete and forceful product to date. You can get a sense of what the album may sound like from the recently released single "Snow Globe"
Roommate will be performing at The Hideout on Feb. 5th with SHAPERS as part of a Coach House Sounds show. The record release show for Guilty Rainbows will be on March 18th at Empty Bottle with Dozens and Algernon. On April 5th, Scattered Trees will release their full-length record, Sympathy, via Roll Call Records/EMI. In anticipation of the early Spring release the band has released a new track from Sympathy called “A Conversation About Death on New Years Eve”. The band will also be performing on January 21 at Schubas. The Loneliest Monk "The Ghost and the Silhouette"
Last month, The Loneliest Monk released a haunting video directed by Rubbish and produced by Hystk for the track "The Ghost and The Silhouette".